Okay, good reader, let's play a game. I'm going to make a list of every modern horror film cliche, and we're going to check off each and every one that exists in the 2019 remake of Stephen King's brilliant horror classic, Pet Sematary. It's almost as if the filmmakers here buried the original film in the Micmac ground and it came back as this evil piece of cinematic garbage. This film was obviously trying to imitate the formula used by the 2017 It remake, changing a lot of the plot to make it different, but still stay true to the original idea. Where It succeeded, this film failed miserably. It didn't help that it constantly rubbed bait-and-switch tactics in our faces. The film expects you already know the story, then it spits in the face of what you know. We're never properly introduced to characters or situations; you're expected to already know them. Then, when the film leads you into what you think you know, it teases you, then changes it to a much inferior story element. From beginning to end, this film is dark, drab, and trying to scare you in every over-the-top manner so common to modern day horror films. None of the characters are likable, and their relationships feel forced. John Lithgow is practically repulsive as Jud Crandall, the neighbor who is supposed to become almost like a father figure to Louis Creed. Instead, he comes off as a deceptive, creepy old man whose cheese has already half slid off his cracker. Victor Pascow is never really utilized to further the plot; he just randomly appears for shock value. The problem with this film, like so many other films these days, is that the filmmakers don't let the story speak for itself. They feel the need to go over-the-top in every way possible. Pet Sematary is known as the one story of Stephen King's that he almost didn't published because he felt it was too scary, that he had crossed to many lines. The material itself is so visceral, so terrifying, that it doesn't need gimmicks and trickery to keep an audience interested. Putting all that modern filmmaking junk into this story puts it into the same category as all the other remakes of classic horror films, like A Nightmare on Elm Street, Friday the 13th, Carrie, and Rob Zombie's Halloween. Hopefully, this film will fade into oblivion like all those other remakes. To clarify, I'm not one of those people who says books are always better than movies. I've seen plenty of movies in my day that I actually prefer to the books. I'm also not one of those people who automatically hates remakes. There have been plenty of remakes that have actually been better than the originals. I'm not one of those people who automatically hates when an adaptation or a remake changes story elements. I reiterate, 2017's It changed a lot, but it remained true to the spirit of the story. 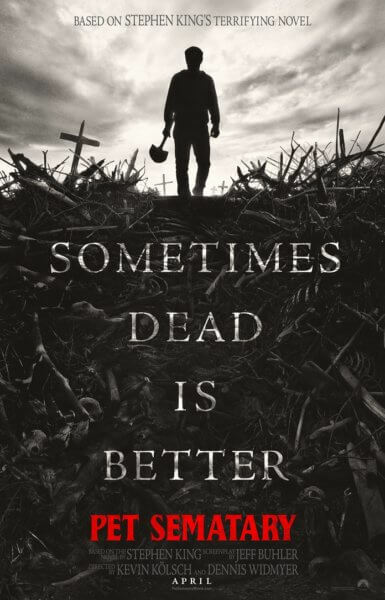 2019's Pet Sematary doesn't let the changes happen naturally. All the changes seem forced and detract from the naturally frightening tale. Pet Sematary is one of Stephen King's best stories, and to have it treated with such blatant disrespect deeply saddens me. I hate that this film exists. To be completely honest, I'd rather watch 1992's Pet Sematary Two than this abomination. Stay far, far away from this film. This is not Pet Sematary.